Quintin Mikell, then a safety for the Philadelphia Eagles, talking about how much fun it is to hit (and be hit). This week’s Freakonomics Radio episode is a rebroadcast of the very first episode we ever put out: “The Dangers of Safety.” (You can subscribe to the podcast at iTunes or elsewhere, get the RSS feed, or listen via the media player above. You can also read the transcript, which includes credits for the music you’ll hear in the episode.) It’s about how some of the safety measures we embrace — like modern football helmets — may unwittingly make us more reckless. I recently found myself looking back on my musical career — the one I quit. 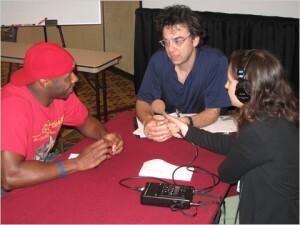 This led me to start looking back on the five-year history of Freakonomics Radio. I started digging through the archives — and kept digging and digging — and finally got to this maiden episode. Why not? I thought. It’s August — time for a repeat — and what’s the worst thing that can happen? If you’d like, you can read the original blog post that accompanied the episode. A few updates worth considering: Quintin Mikell, then a member of Philadelphia Eagles, is now out of the NFL; Terence Newman is still playing but now he’s with the Vikings. Robert Cantu is now a senior adviser to the NFL’s Head, Neck and Spine Committee, and the whole topic of brain injury has become more pressing. And when we say in the podcast that “more people watch [the Super Bowl] on TV than any other show,” we should have said “any other show in the U.S.” Because American football can’t really compete with futbol. And one more thing: my son Solomon is no longer 9 years old; he’s 15 and his love for football has been eclipsed by his love for, yes, futbol. No comparison between American football and rugby? Really?! I agree with the premise, but thought it was worth pointing out that NASCAR is probably the worst example you could give. First, the increase in safety equipment over the years also has been accompanied by an increase in speed... so not exactly like for like comparisons when looking at driving behaviors of past and current drivers. But secondly, and more importantly, the thing that causes drivers to want to avoid crashes is first and foremost that they don't want to be put out of the race. This is probably best seen by the attitudes drivers have toward restrictor plate races - which slow speeds, cause 'bunched' driving, and (arguably) increase crashes. The drivers by and large don't like these races because they are more likely to be involved in a crash that will put them out of a race (even though that crash theoretically should be 'less fatal'). Hence, its more their desire to not be forced out of a race that causes them to drive more (or less) cautiously, than it is their desire to not get hurt. Stephen, your current voice 'sounds' younger! I just read an article about police in Norway and how many officer involved shootings deaths they have had in the last 9 years (1 since 2006) and the article actually ties in "safety" with "increased danger." In a nutshell, officers who have immediate access and authorization to to use their firearm may be provided with "a ‘sense’ of safety to a detrimental degree" and possibly more likely to rush into more dangerous situations than officers who are not armed. I realize it's a relatively crazy notion for Americans to consider unarmed police officers but many industrialized nations have police forces that do not routinely carry firearms or have to have clearance from their chain of command to use them. I am certain there are TONS of statistics that I am not accounting for, such as civilian access to guns, rate of violent crime, etc. versus these other in countries with unarmed police forces, but there also may be a chicken and egg type thing going on w/ US police becoming more and more militarized, as well as arms races (so to speak) between cops and violent criminals. The article also talks about officer training and department policies, rather than just disarming police. If you want posted links to articles cited here is the website: http://theantimedia.org/heres-what-norway-is-getting-right-about-cops-that-america-just-cant-figure-out/, otherwise you can moderate it out if you want. To me, the police's routine use of lethal force in unwarranted situations (unarmed, already cuffed, etc.) is becoming an epidemic and even though there is a microscope on law enforcement across the country it seems to be getting worse. Even though this week's podcast is largely about sports equipment I think the article cited above, and the article that it was inspired by, really fit well within "the dangers of safety" and could use some further consideration in the reduction of police use of lethal force. Playground equipment is another area that could have been covered. When you build safer equipment, kids take bigger risks. When you make it low to the ground, kids climb on the roof. When you put padding down, kids jump from higher heights. When you drill parents with the safety message, they go down the slides with their toddlers, and break their toddlers' legs. When you put everything in one open area, for simpler adult supervision, you get more bullying (because there's no corner where you can play and stay out of the bully's line of vision). And that doesn't count the losses: Merry-go-rounds stimulate the vestibular system, which may help some kids with sensory processing disorders or autism. They improve balance and confidence in typical kids. They promote cooperation (the big kids take turns pushing, the little kids ride) and sensitivity to others (they slow down or stop if someone is scared or dizzy). But it's hard to find merry-go-rounds in parks these days: they've been deemed "unsafe", and although safer versions exist (with exterior rails to keep kids from falling off, seats, and sometimes even seat belts for kids with physical limitations), these safer versions are almost never installed as replacements. I'm guessing "enter your name" didn't ride the same merry-go-round I did. It still exists in a park in Portland. It didn't promote cooperation, the big kids would vie to push so fast the little kids couldn't get on, nor sensitivity--scaring everybody else was the aim. Getting dizzy--well it was before drugs existed--that was also a point. The physical trauma was even worse, I'm sure I'm down quite a few brain cells because you only had a 50% chance of getting on the thing without getting hit in the head with a fast moving metal bar. Profusely bleeding scalp wounds were common. Although I'm not into coddling kids I think today's playground equipment is both much safer and more interesting. I've seen only one merry-go-round in recent years, and I have seen none of these problems. It's a pretty old all-metal one. Maybe kids these days have more sense. Almost all of them wait until it's stopped before they get on. I haven't seen any kids injured on it. Chuck Hughes 1971. Not because of trauma though. A wonderful episode -- as provocative today as it was when I first heard it. Early on, the following point was made about driving. "If nothing were to kill you except driving your car, and all you did was drive your car day and night, day and night, you’d expect to live for 250 years." This was a clear way to illustrate the point, and I'd like to add it to my repertoire. Can you step us through the math? How did you arrive at the 250 year figure? Helmets can protect the face, the skull, and reduce a lot of pain, however, they cannot prevent concussions or traumatic brain injury. How many hits (Crashes) at street speeds does it take to cause a TBI? Why isn't the motorcycle industry taking this problem as serious as the NFL? Would anyone tell me the name of the background music at the end of the episode? I like it so much! Really football can't compare by futbaol? Does anyone know what music was used for the end credits of this episode? I really enjoyed it, and would love to listen to more of it.